With this an election year, I am anxiously wondering if we are going to see Hillary Clinton on the ballot for President? 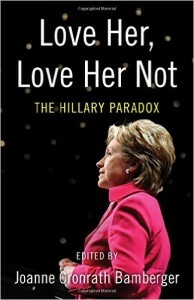 That in mind, I was caught by the title of Joanne Bamberger's book "Love Her or Love Her Not The Hillary Paradox". As a contemporary of the former First Lady, I have my own thoughts and opinions concerning her and why she would or would not make a good President of the United States (POTUS). I am not worried about her haircut or her sense of fashion! I often wonder what women like myself think of Hillary and why. Joanne Bamberger has provided me with a great read Love Her Love Her Not along with an answer to my quest for other diverse women's opinions about Mrs. Clinton. At this time in our country's history, I personally find it fascinating reading what other women are saying about Hillary. She has definitely had her share of controversies from her choice of Inaugural attire at her husband 's swearing in as POTUS, to her "stand by your man" commitment to Bill Clinton after his foray with Monica Lewinsky and his subsequent Impeachment. Currently, she continues to battle many more serious issues and questions about her actions while she was United States Secretary of State during President Obama's administration. What are your thoughts about Hillary? Not too many of us sit on the fence where Hillary is concerned, wouldn't you say? I have enjoyed Love Her Love Her Not The Hillary Paradox very much and hope to attend a book signing and discussion at Women and Children First bookstore here in Chicago on January 27th, Wednesday night at 7:30 pm. It should be an interesting and stimulating group getting together. So think about bringing yourself to the book group this Wednesday evening and take the opportunity to meet Joanne Bamberger and share your own thoughts about Hillary.